In the New Testament the metaphor of fire is often associated with judgment and "coming wrath." "His winnowing fork is in his hand to clear his threshing floor and to gather the wheat into his barn, but he will burn up the chaff with unquenchable fire." The text suggests that Jesus has something different in mind for his "baptism by fire." And perhaps something different from what John the Baptist had in mind. But let's pay close attention to a few different things. Notice that Jesus connects baptism to the fire coming to earth. An despite his earlier baptism in the Jordan this is a baptism that Jesus has yet to undergo. I take Jesus to be referring to his crucifixion. Also note that the fire Jesus is bringing is kindled "on earth." This isn't an otherworldly hell, but a fire that is experienced--as a disruption--in intimate social relations. And that's the last thing to note. The vision of judgment prophesied by John the Baptist--where Jesus has a winnowing fork in his hand--is shifted by Jesus away from the notion of throwing bad people into the pit of hell (the vision the disciples seem to be working with in Luke 9, a notion that Jesus rebukes) and toward people being divided up and sorted--wheat winnowed from chaff--in their social relations. Summarizing, Jesus's crucifixion brings a fire of judgment to earth--a baptism that winnows, separates and sorts--causing social tension and conflict. But the puzzle remains. After his death when do we see Jesus "baptize by fire and the Holy Spirit" as prophesied by John? When do we see Jesus's fire kindled on earth, a fire that winnows and disrupts social relations? 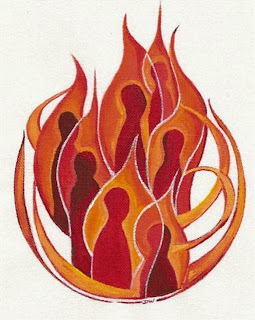 On Pentecost we finally see the baptism prophesied by John, Jesus's baptism by fire and the Holy Spirit. At Pentecost the fire of judgment falls from heaven and is kindled on earth. But what is strange here is that the fire doesn't fall on the bad people. John's hellish "unquenchable fire" of judgment falls upon the church. The church becomes hell on earth. And we see in this the winnowing that John and Jesus predicted, how the fire begins to interrupt and disrupt social relations. After hearing Peter's sermon on Pentecost the people cry out "What shall we do?" And in response Peter offers them hell. Step into the fire now kindled upon the earth. Step into the baptism of fire and the Holy Spirit. Throw yourself into the flames of Pentecost. Step into the church and save yourselves. "Those who were being saved." This is what salvation looks like. This is the winnowing. This is the fire of heaven now kindled on earth. This is the baptism of fire and the Holy Spirit. Save yourselves from this corrupt generation. Step into into the flames of Pentecost. Step into the fire Jesus kindled upon on earth. The coming wrath prophesied by John has come, the flames of heaven are upon us. This is the most textually-consistent explanation of Gospel references to the baptism of the Holy Spirit and Fire that I've come across. For me it begs the question: how do references to a city dump outside of Jerusalem fit into this context? not enter the city. For this is the time of punishment in fulfillment of all that has been written." So, the winnowing here is between those who "learn the things that make for peace"--the church, the Kingdom of God--versus those who choose the way of violence in the world, those who bring about their own destruction and find themselves cast into a place where there is weeping and gnashing of teeth...in this world. Thanks so much for your attention, and I really don't want to monopolize the comments. I'm just having trouble making the connection. Was Gehenna a graphic threat to Israel for not learning "the things that made for peace"? At Pentecost they asked what was happening and were told these are the times prophesied by Joel the prophet. Wasn't Joel alluding to the destruction of Jerusalem in 70 AD? That's the way I've seen it. When they asked how could they be saved I assumed they meant this prophesy. But in the frame I use in my comment above the argument is that every reference to hell, judgment, Gehenna, the lake of fire, etc. etc. is a reference to a concrete historical event--the destruction of Jerusalem in AD 70. I try to make that connection in my comment to Whit, that Pentecost begins the winnowing that will culminate in the destruction of Jerusalem. Still, what I think is strange in all this is how the "baptism of fire" prophesied by John falls on the church rather than upon "the world" meaning that to "be saved" one has to run toward the fire rather than flee it. Thanks, When I try to show people that connection I get some strange looks. I was beginning to think I was crazy. Excellent, both the post itself and the comment replies below/above/wherever. This post is so inspiring. I'm a person who us already in the church but so often trying to lean out and away and keep from being too sucked in. But redemptive fire sounds worth it.